We have many years experience of designing and making all types of handmade bespoke furniture. Our diverse experience means we are familiar with both contemporary and traditional styles. To see examples of some of our recent commissions visit our Furniture Commissions portfolio. Well fitted furniture requires specific design solutions for successful results. Our experience in designing and fitting bespoke kitchens and furniture can benefit your project. 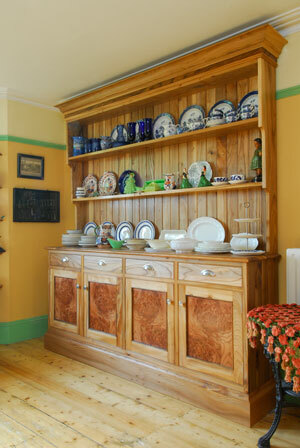 Qualified master craftsman Sean Burrows has many years experience as a skilled cabinet maker, and is able to undertake all manner of fine furniture commissions and bespoke furniture projects. From kitchens to bedrooms and most rooms in between, modern homes benefit from bespoke storage solutions to store, organise or archive the items we need but don't want to display. Visit our Storage Solutions section to see some of our recent projects. Bespoke wardrobes and bedroom furniture offer a personalised solution to suit your individual personal organisation needs, as well as enhancing the beauty and character of your home. Visit our Wardrobes section to see some of the solutions we've created for our customers. From classical edifices to modernist statements, bookcases can be pieces of bespoke furniture that add quality and decorum to your home. From dining tables to coffee tables, side tables to dressing tables, handcrafted tables can be especially satisfying, both to commission, and to make. Our experience in making bespoke kitchens and handmade furniture for all areas of the home, coupled with our attention to detail and strong project management skills can benefit larger domestic projects to create continuous or complimentary styles through the home. With many years of innovative design solutions behind us we are happy to develop bespoke kitchen and furniture commissions from an early stage. © 2019 Bristol Fine Furniture. All rights reserved.